I was brought up on the austere adage ‘Don’t look forward to something too much and you won’t be disappointed’ (and was well into adulthood before I realised what a killjoy statement that was!). These days it gives me great pleasure to witness my children looking forward to doing something so much that they’re fit to bursting with excitement. A little jumping for joy never did anyone any harm. And nor does some occasional disappointment; sometimes life does have a habit of biting you on the bum. My daughter recently moved up to a ballet grade where she can start learning to dance en pointe. This, as anyone who has a ballet-dancing child knows, is a Big Deal. And to dance en pointe you must, of course, have pointe shoes*. 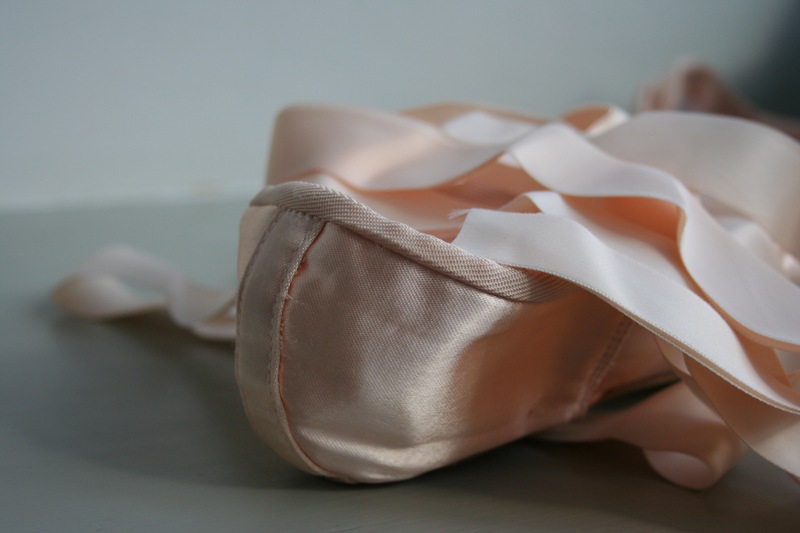 Beautiful, satin pointe shoes. The first lesson with the new shoes was set for this evening so I picked her up from school on Monday and we drove to a specialist dance shop for an appointment with a specialist fitter (it is very important that these shoes are fitted correctly to avoid damaging dancing feet). We were shown to the back of the shop where there were stacks of shoes – shelves and shelves of beautiful satin slippers; her mouth did actually drop open – a sofa for attendees and a little area of wooden dance floor with barre and floor-to-ceiling mirror. It had ‘long evening’ written all over it. Happily the lady in the shop seemed to know exactly what she was doing and the second pair selected fitted perfectly and didn’t hurt one bit (obviously quite important). Shoes on, my daughter stood there en pointe, holding on to the barre, beaming with sheer delight. These were The Ones. ‘These shoes are Russian’, the lady said. ‘Handmade’, she added. I sighed and held my breath for what was coming. A little while later, credit card quietly weeping in my purse and after strict instructions about how to sew on the ribbons and elastic, stick on the suede toe protectors and about wearing the toe pads, airing the shoes and not getting them wet, we were on our way home. I promised to wait until my daughter got home from school the following day before I sewed on the ribbons. To be honest I was dreading sticking a needle into these expertly-made shoes, worried that my cack-handed sewing would completely ruin them. I managed to get one shoe done (I did my best but I’m sure any ballet-shoe cobbler would shudder) before getting caught up in the evening routine. I’d do the other one the next day… The next day the school phoned. My daughter was in the sickbay. She’d been playing football** at lunchtime and hurt her knee, could I please go and collect her. Yes, she probably did need to go to hospital. A couple of hours later and we were back home with my daughter on crutches. She’s damaged the collateral ligament in her left knee which means strict resting for 48 hours and absolutely no sports (especially dancing) for at least one week, possibly two. Her pointe-shoe debut has been postponed and she is gutted. Such is life. It could have been worse and at least I have more time to do the sewing. 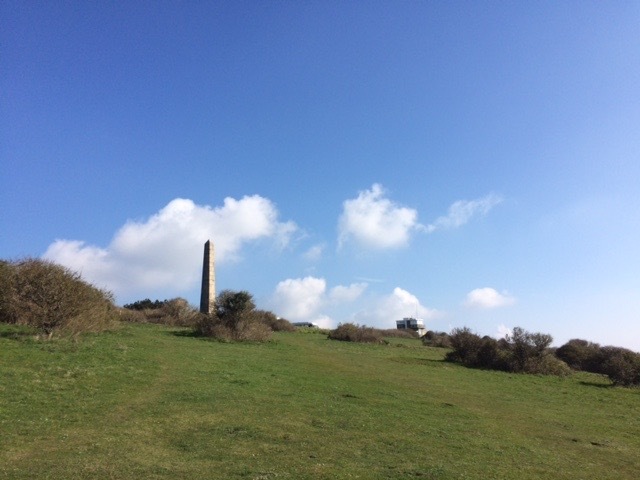 On a lighter note, despite the chilly, chilly wind, there have been some gorgeous blue skies this week. I know there has been snow in parts of the country but Spring is doing its best to cling on here in the south east. 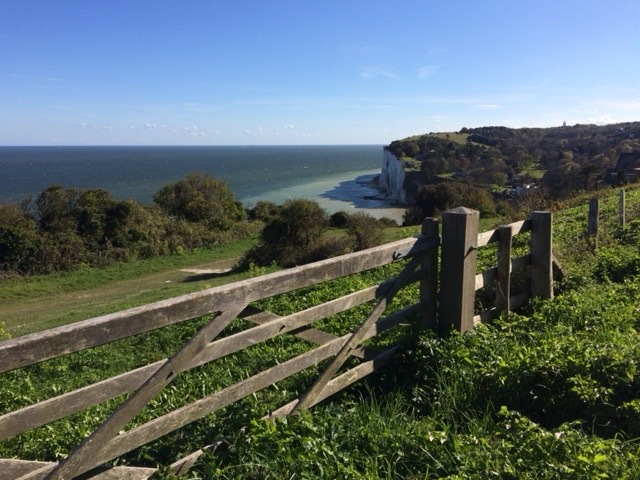 Wishing you a lovely May bank holiday weekend – here’s hoping for blue skies wherever you are. And a little excitement. 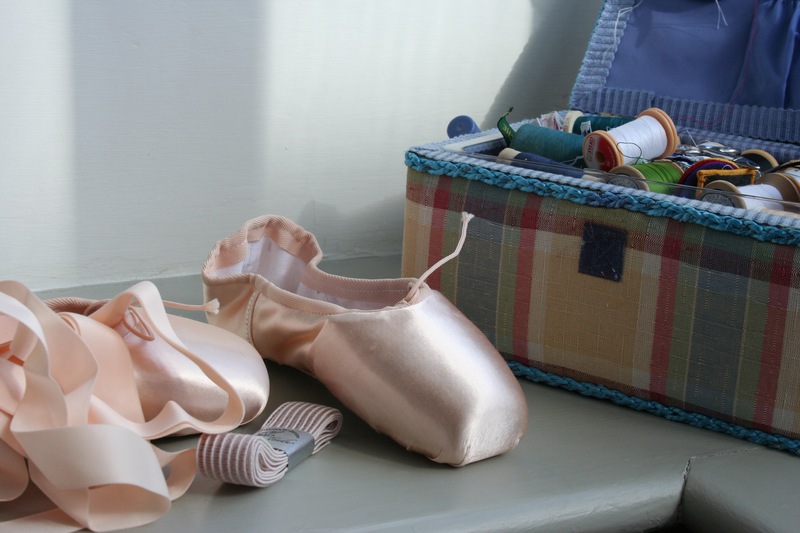 *Pointe shoes might look gorgeously soft but they are surprisingly hard – the toe block and base are made of layers of papier-mache. To protect precious feet, dancers wear a little padded, silicone ‘toe-socks’ inside the shoes. I hope your daughter is much better soon and can enjoy the joy of dancing in her new shoes! I can imagine the sewing required by you being terrifying, it sounds it. You – and your daughter! – will be great though! Pointe shoes are so pretty and of course a very special milestone. I hope it’s a quick recovery so she can try them out soon! I hope she’s all better soon. I am soooo excited for the day my daughter can begin pointe training. Her ballet school starts them at 11, and they have to earn their pointe shoes, it’s a very big deal. She’s seven now, finishing her fourth year of ballet, and she loves it so much. Last year, I happened to be in the studio the day the 11-year-olds got their pointe shoes and I was choking up watching them, they were so happy and proud of themselves. It’s such a wonderful milestone, you and your daughter should be very proud! Half the joy of an exciting event is the looking forward to it. None of my children showed any interest in ballet and looking back maybe I should have encouraged them so that I could have sat in the warm when they performed, rather than standing on the side of cold sports pitches. Hope your daughter soon gets to wear her shoes. I always get in a knot about whether I should ‘like’ a post like this. Clearly I don’t like what’s happened but it’s a beautifully written, thought provoking post. The shoes are beautiful. My oldest daughter took ballet for several years when she was little, but never advanced to this point. Her ballet slippers were pink leather, and quite scruffy looking as they were hand-me-downs. I’m so sorry your daughter got injured and couldn’t wear them right away. I agree that sometimes life does bite you in the bum, but it is ever so hard when you see it happen to your own child. Mine are all grown up now, but it still tugs at my heart when they face big disappointments. Ballets shoes are so very evocative. I was so eager to have my first girl start ballet classes, she began on the day she turned three. Oh, she was so darling in her little leotard. These days she’s a hockey goalie so the gear is far less romantic. Oh no! You’re right, it could have been worse and your daughter’s day will come. Have a lovely weekend. It would be nice to see it get a bit warmer that’s for sure. Oh wow Sam, this is gorgeous! I am completely fascinated by the world of ballet and follow a lot of ballet dancers on Instagram! Those shoes are so precious, I can only imagine the shop. Good luck with the sewing and I hope your daughter recovers quickly from her football injury. What a shame for your daughter! I hope she wasn’t crushed. 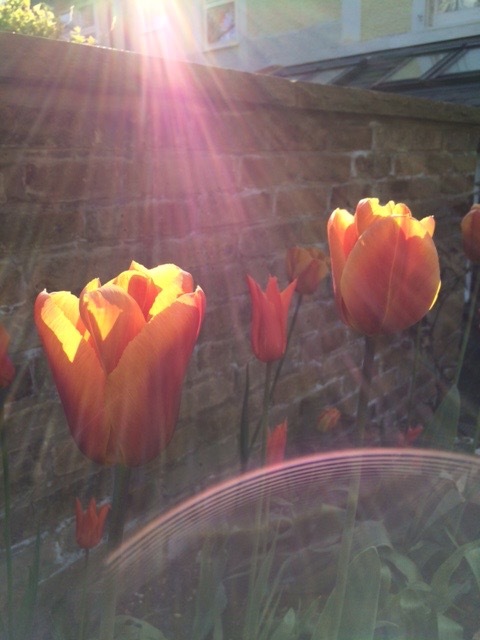 Wonderful photo of the tulips with sunlight. Oh dear Sam, I hope your daughter makes a full and speedy recovery. This post took me back seven years to the May morning when my daughter dislocated her knee indoor hurdling during a school PE lesson (!). It interrupted ballet and everything else for a short while and although she continued dancing she made the decision to dispense with the exams. Multiple knee dislocations later (she was always very bendy and stretchy) and a lateral ligament release two years ago (we’d hoped she’d grow out of it and we’d avoid surgery) she is now completely fine. Hope it’s warm and sunny with you this weekend, although the tulips are loving the coolness I think. Sadly, I guess if your daughter wishes to do well in ballet she will have to choose between it or football. I hope she soon recovers. Stick on pointe protectors?? Wow! The world has moved on. I lost track of the number of pointe shoes I painstakingly embroidered to protect the pointes. Miles and miles of tiny chain stiches going round & round. Ballet is such good physical training. It will stand her in good stead for any sport she takes up. I am very relieved indeed that there is no embroidery involved these days!